Spinal traction is one of the oldest medical techniques in the world, dating back to more than 2000 years. The practice began among the Greeks and is still used my medical professionals around the world. The process of compressing and decompressing a body part or limb has proven to be of immense help during healing or rehabilitation processes. What is Spinal Decompression and Spinal Traction? In layman’s terms spinal decompression or spinal decompression therapy is the stretching of the spine to help relieve pain in the back or the leg. Spinal traction is a part of the decompression therapy and involves relieving the pressure off compressed discs. It is used to treat herniated discs, sciatica, degenerative disc disease, pinched nerves and many other back conditions. Manual – In this process, a physical therapist uses their hands to put the body in a state of traction. Then, manual force is used to widen the spaces between the vertebrae and thus release pressure. Mechanical– This technique involves the use of traction table. 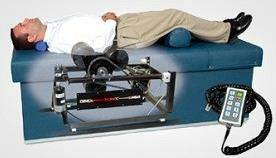 The contraptions on the table allow a person to easily stretch the spine and thus release pressure off the discs. What are the Pros and Cons of Spinal Traction Therapy? What is a Traction Table? As the name suggests, these tables are specifically designed to put the patient in a state of traction. They are mechanically or electrically operated and many a time does not require the assistance of a medical professional. A simple at home traction table can also do the job for you. Delivers a soothing massage and helps release muscle tension. The exclusive Glide-Trak System provides an ease of use and is operated automatically. The elevation and vibration can be controlled easily with a hand-held remote control attached with a cord. Fitted with 3 nylon massage rollers it offers full treatment solutions for the spine or targeted areas. Armedica Quantum 400 Intersegmental Traction Table also includes a control pendant, a knee bolster, and a foot cover. A unique innovation in this sector, the traction table is a one of a kind device that works specifically for one goal. They can be used both in medical institutions and homes. The right traction table can help you skip a lot of days of pain and discomfort.